Once upon a time, there was a devoted housewife who put on her pearls and heels. Then she killed people. This is the story of Mrs. Josie Schuller, an early 1960s housewife who freelances as an unassuming assassin. Written by Joëlle Jones and Jamie S. Rich, Lady Killer offers a linear story and the evident symbolism of the era, all illustrated (by Joëlle Jones) in relevant vintage fashion with pertinent pastels (colors by Laura Allred). This Dark Horse Comics publication features lettering by Crank! Is protagonist Josie Schuller a killer of ladies, or a lady who is a killer? Both, it turns out – which begs the reader to examine the complexity of characters and people. I can’t stand when comics present flat female characters, and in this story, the title itself opens the door to a more insightful depiction, replete with glorious violence. The death scene is as graphic as you might hope. Fans of Dexter will approve. This comic also passes the Bechdel Test in a very interesting way. Two women have a conversation, confrontation, and a murder party without mentioning a man. Pretty cool. This is a big contrast to the killer’s home life. There, she motivates her daughters to clean up by reminding them that their father will be home soon. The aesthetic plays an important role in the vintage landscape. Our killer first appears as an Avon saleswoman and makes sure to keep up appearances herself as the story goes on. Ultimately, Lady Killer is about a woman who lives within confines of society, but gets to take out an unwanted element. It’s a job for her, and she has a reputation for getting things done – and we are left with the right amount of questions, especially as the issue leaves her at the beginning of her next job. Is her motivation in the want of more excitement, flirtation with her boss (Peck) or the satisfaction she’ll get for killing her next mark – after he offers the ultimate catcall in a club setting? 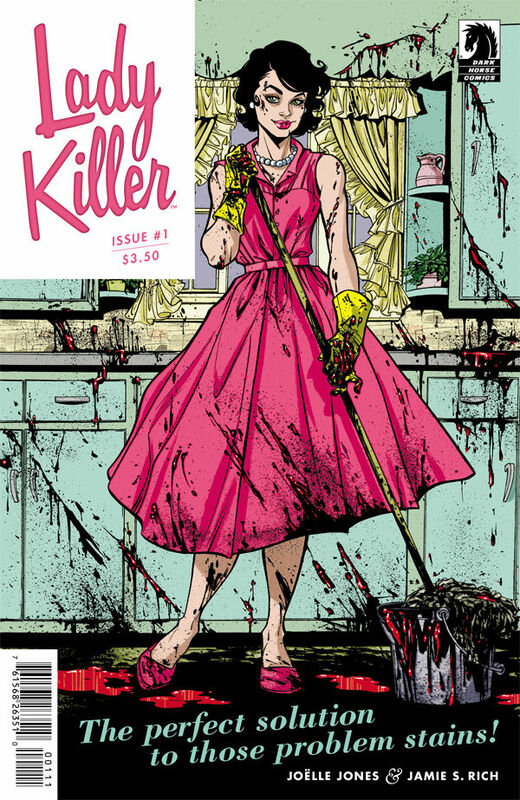 Lady Killer is a five-issue series – on sale 1/7/15. Learn more at DarkHorse.com.